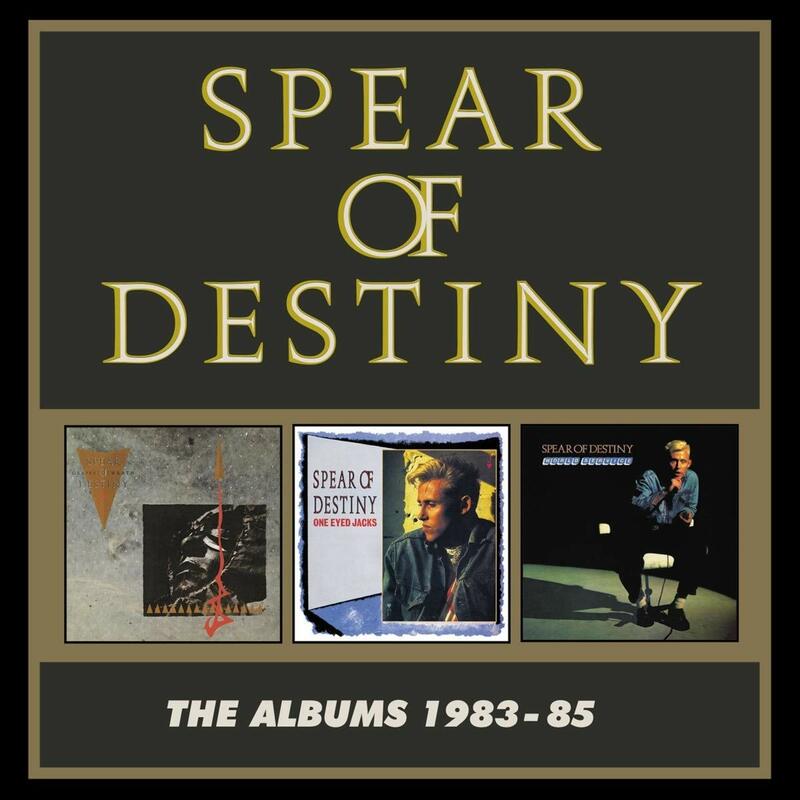 Discussions Magazine Music Blog: SPEAR OF DESTINY/THE ALBUMS 1983-85 (3 CD set) reviewed! SPEAR OF DESTINY/THE ALBUMS 1983-85 (3 CD set) reviewed! While he hasn't quite achieved the fame and fortune of his contemporaries, British post-punk icon Kirk Brandon has remained one of the genre's most beloved artists to this day. From his late-‘70s recordings with The Pack to his groundbreaking work with Theatre Of Hate between 1980 and 1983, Brandon's unique musical vision gained him an enormous amount of respect from critics and adulation from fans. When he suddenly split up TOH in 1983 and formed Spear Of Destiny (alongside TOH bassist Stan Stammers), it came as a complete shock to those who had followed them from their early singles to their album DO YOU BELIEVE IN THE WESTWORLD (produced by The Clash's Mick Jones). But Brandon's musical vision had matured and changed and he needed a new vehicle to showcase the next step in his career. While not entirely dissimilar to TOH, Spear Of Destiny allowed Brandon to both refine and redefine his sound. Some have called the band’s music ‘Goth’ but that is the furthest thing from the truth. Yes, the band’s music can appear to be dark at times but the darkness that takes up space in SOD’s music is more a reflection of life rather than a deep dive into despair. Stripping away Theatre of Hate’s musical blueprint and rebuilding it from scratch, 1983’s THE GRAPES OF WRATH was SOD’s astounding debut full-length. Produced by Nick Launay, the album is a confident step forward that blends a myriad of styles into Brandon’s Post-Punk musical vision. “Flying Scotsman” features a slight nod to Scottish/Irish Folk while embracing Gospel as well. “The Wheel” has become an SOD classic with an arrangement and production that is both skeletal and full-bodied at the same time. “The Murder Of Love” is an upbeat track that still manages to feel haunting and ominous. Like many of Nick Launay’s productions, THE GRAPES OF WRATH is rhythm-heavy, relying on the steady hands of drummer Chris Bell (Gene Loves Jezebel) to provide a strong rhythmic backbone to Brandon’s passionate vocals, which often become howls when the mood arises. The album’s title track features a Cure-like bassline from Stammers surrounded by classic Brandon wailing and moody sax drifting in the background. In the end, it is difficult to compare THE GRAPES OF WRATH to any other album released in 1983. Kirk Brandon and SOD created a unique album that both defines and defies that year. The album is joined here by nine bonus tracks include long sought-after ‘cassette mixes’ and live recordings. In 1984, Brandon and Stammers returned with an all-new expanded SOD line-up including drummer Dolphin Taylor (Tom Robinson Band/Stiff Little Fingers). This time produced by Nick Tauber, their sophomore album ONE EYED JACKS was more direct and melodic than their debut. While not a commercial overhaul of their sound, the album is just as unique as their debut but on a different level. Under Tauber’s production, the band strips away the atmospheric elements of their sound and becomes more powerful because of it. Every track takes the listener in a new direction, sometimes switching gears mid-song (“Rainmaker” and “Everything You Ever Wanted” immediately come to mind). With a slicker producer, Kirk’s wails are more pronounced yet the resonate with so much emotion. “Don’t Turn Away” has a Gospel Rock vibe that is inspiring. “Forbidden Planet” is a crazed Post-Punk work out with elements of Dub and contains some wonderfully sublime hooks within the craziness. Unsurprisingly, the track leads into the Reggae-fied “Attica”. “Liberator,” “Prisoner Of Love,” and “Playground Of The Rich” pop up at the album’s midpoint and are most certainly the album’s emotional center. The piano-led “These Days Are Gone” is a nice haunting closer to this excellent SOD platter. The CD includes 10 bonus tracks including extended mixes, non-album tracks, live cuts, and more. The band returned with the same line-up for WORLD SERVICE in 1985. Produced by Rusty Egan (Visage/Rich Kids/etc. ), this third album was as melodic as its predecessor but the production was less bombastic and more organic. “Rocketship” and “Up All Night” open the album with power and melodic hooks. “Come Back” remains one of the band’s catchiest singles and could have even made a dent in the U.S. had radio stations decided to put it into rotation. “All My Love (Ask Nothing)” is as close to a Motown song as SOD was ever going to get. As the album progresses, it is obvious that SOD had become a true force to be reckoned with, offering up anthem after anthem (even the ballad “Mickey” is an emotionally powerful anthem in its own right). For anyone that considered SOD a ‘Goth’ band need look no further than this album to realize just how wrong they were. Hell, there are some great horn arrangements on this album (and you certainly won’t find many horns on a Bauhaus album, will ya?). But don’t get me wrong – SOD was never a band that could sit up on top of the charts with Duran Duran, Spandau Ballet, A Flock of Seagulls and all of their contemporaries at the time. Spear Of Destiny was – and is – a very unique band led by a very unique singer/songwriter. And WORLD SERVICE is proof to that - which makes this album the third winner in a row for Spear Of Destiny. The CD features seven non-album tracks including remixes. THE ALBUMS 1983-85 is a stellar release that will remind you that Pop music can be unique, dangerous, melodic, and soul-stirring at the same time.